Some more information and imagery has spilled with regard to the purported Xbox One S All-Digital Edition. Last month HEXUS updated readers on the disc-less console. A few hours ago Windows Central provided some more information about the upcoming console release, and shared some box art. Windows Central says that it has received product shots of an Xbox One S All-Digital Edition console. However, to protect its source(s) the site re-created the console and box shots it had been sent in Adobe PhotoShop, and that is what you see here. From the product shots it saw, the new console will look "virtually identical to the current Xbox One S, without the disc drive and eject button". Furthermore, packaging shots indicated that there will be at least one bundle available configured as follows: a 1TB HDD installed, with Forza Horizon 3, Sea of Thieves, and Minecraft digital codes in the box. At the time the packaging was created there are no indications that Microsoft's Netflix-like subscription service for games, Xbox Game Pass, will be bundled. While the All-Digital Edition of the Xbox One S will have the lowest MSRP of any current console in the family, the exact pricing remains an unknown. It is entirely possible that Microsoft hadn't set prices in stone, for the multitude of release regions, as yet. Turning to launch and availability dates. 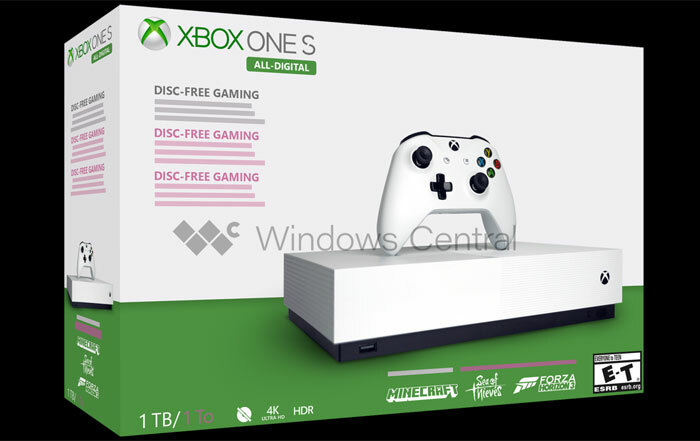 The latest information indicates that we will see this disc-less Xbox One S unveiled at Inside Xbox mid-April, before the console gets worldwide release on 7th May. If you are thinking of buying an Xbox One S console, then perhaps it is worth a wait until April/May to see what you can save by opting for the model sans-Blu-ray drive. All images from Windows Central. It's 100% the reason why we own an Xbox One S. But, I imagine we're a very small minority, with the vast majority now buying their games digitally. The games on the xbox store are always way overpriced, even during sales! Maybe I am old fashioned now with my discs 0_o it's not like I'm hanging on to something - they're just cheaper! Maybe Game Pass is more popular than I thought? Possibly not, the bluray player is the reason we have a PS3. Edit: and I'm sure my son watches movies on his One S.